Blackhawk Epoch Tactical Level 3 Molded Light Bearing Holster FREE SHIPPING! The Epoch Level 3 Light Bearing Tactical Holster by Blackhawk offers a drop-leg design with triple retention and the ability to carry under-barrel lights. 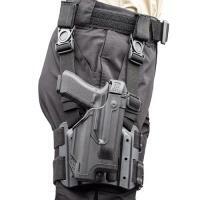 This holster has been designed with a Y-harness system so it can adjust and conform to any size leg while evenly distributing its weight and maintaining its position. The weapon retention system engages as soon as the pistol is inserts, keeping your weapon securely holstered until you release it. The Pivot Guard is thumb-activated so it cannot accidentally close or lock you out. You'll also draw with your fingers placed in at-ready positions - in a full master grip - thanks to the EPOCH Auto Lock release's placement. This holster is also designed to accommodate popular under-barrel lights and there are accessory mounting points so you can add magazine cases, pouches or whatever else might fit. You'll certainly be ready for anything. Holster carries one pistol at mid-thigh height. EPOCH Auto Lock thumb release (patent pending). Thumb-activated Pivot Guard and Ejection-Port Lock. Fits popular under-barrell style lights (TLR-1, TLR-2, X300 and X300U-A). No snaps or hoods to accidentally open. Y-harness system distributes weight evenly and keeps holster vertical. Quick-disconnect swivel buckles for quick mounting/dismounting. Amazing product. Wouldn't expect anything less from Blackhawk. ©2002-2019 CopsPlus.com: Blackhawk Epoch Tactical Level 3 Molded Light Bearing Holster FREE SHIPPING!